September 21, 2015 — San Diego CA. In an NBC News investigation about the dangers of IVC filters, a former insider at C.R. Bard raised questions about how the device was cleared for the market. Back in 2002, Bard recruited Katy Fuller, a regulatory specialist, to help grant FDA clearance for its IVC filter, after the FDA previously turned down an application. The IVC filter was designed to sit inside a major vein, the vena cava, and block blood clots from traveling to the heart or lungs. In an interview with NBC News, Fuller claimed that she had serious concerns about the IVC filter. In a small human clinical trial red flags were raised and the company did not give her important safety performance test results. However, when Fuller voiced her concerns to Bard, officials didn’t want to hear them. 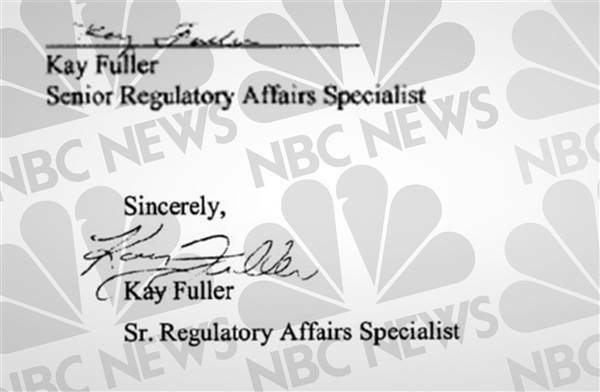 When Fuller was shown a copy of the signature in the interview she stated that it was not her signature. A sample of her signature from that time is markedly different from the one on the application. But was her signature forged? Close to a quarter of a million blood clot filters are implanted each year. Eleven different companies sell them in the U.S., but Bard’s IVC filter stands out as a dangerous device. Bard received FDA clearance, and went on to sell around 34,000 patients Recovery filters. Records revealed that over the course of a decade, the filter was associated with 27 deaths and several hundred non-fatal problems. As reports of deaths and injury grow, Bard has still decided not to recall the IVC filter. They hired a public relations firm to develop a crisis management plan that warned “unfavorable press” could damage stock prices and ruin reputations. In addition, the company commissioned an outside doctor to perform a confidential study, which NBC News obtained the results. The filter had higher rates of relative risk for death, filter fracture and movement than all its competitors. The doctor from said study concluded that further investigation is strongly suggested. Contact our IVC filter lawyers and attorneys today – you may receive a large cash settlements from claims filed.